With an array of delectable cuisine on offer, south London is home to a number of restaurants awarded with a Bib Gourmand. Discover inviting gastropubs, traditional tapas bars and imaginative Indians with this guide to the area's best restaurants. All things quintessentially British take precedence at this restaurant. Located at 40 Abbeville Road in the centre of Abbeville Village, Bistro Union is owned and run by the team behind Trinity, Clapham Old Town. Union is a British neighbourhood Bistro where all things quintessentially British take precedence. The bar houses a food preparation area manned by one of our cooks preparing ten daily changing bar snacks listed on a drop down brown paper roll. The menu is made up of British Classics; changing seasonally to reflect the best of our indigenous ingredients. We operate a no bookings policy (first come, first served). We do however accept bookings for the first hour and a half of opening to allow young families with children the opportunity to secure a table. Michelin starred chef Atul Kochhar also boasts a Bib Gourmand for this neighbourhood Indian restaurant. The first Indian chef to be awarded a Michelin star for his Mayfair restaurant Benares, Atul Kochhar has now also received a Bib Gourmand for Indian Essence in Petts Wood. Having lived in Britain for more than 20 years, Atul draws on both Indian and British influences and uses the finest seasonal ingredients to create imaginative takes on classic favourites . Diners will be able to feast on chicken tikka pie with spiced prune compote, fennel scented lamb chops served with wild rocket salad, and tandoori spiced grey mullet served on a bed of oven-roasted asparagus and asparagus korma sauce. Adding a bit of spice to your Saturday night at home, Indian Essence also has a takeaway menu. A small tapas and sherry bar with a daily changing menu. A great team of established restauranteurs have teamed up with Spanish chef Jose Pizarro to set up this wee (only 30 covers) tapas and sherry bar in Bermondsey Street. With a market fresh daily changing menu Jose offers diners a creative wine and sherry list which complements the inventive dishes. Jose Pizarro has all the bearings of a celebrity chef having appeared on BBC's Saturday Kitchen and UKTVFood's Market Kitchen and with his book Seasonal Spanish Food published in October 2009 by Kyle Cathie. This, his first tapas bar in London, was a precursor to the larger Pizarro restaurant also on Bermondsey Street, adding a nice bit of diversity to a small street of very good, very British restaurants and gastropubs. Pizarro Broadgate, a 60 cover restaurant in Broadgate Circle in the City, followed three years later. Creative South African inspired by the seasons. Since opening at the end of 2017, South African restaurant Kudu has garnered a host of rave reviews and even won a prestigious Bib Gourmand accolade. The latest new eatery to choose Peckham as its home, the venue is a neighbourhood style restaurant with a menu shaped by the seasons. The duo behind the restaurant - Amy Corbin and Patrick Williams - draw on their South African roots to serve a menu of creative plates created using the very best produce. Diners can expect dishes like pan roasted pollock, a clam potjie pot (a slow cooking coal pot), peri peri duck hearts and parmesan churros. The drinks menu is made up of locally brewed Peckham Pils, a curated wine list and classic cocktails. Feast on handmade pasta dishes at this Italian inspired restaurant. The duo behind Italian inspired restaurant Trullo in Highbury, Tim Siadatan and Jordan Frieda, are behind Padella, a restaurant which takes Trullo's 'greatest hits' and presents them as eight handmade pasta dishes, made using fresh pasta rolled in the window of the restaurant, hours before service. Located in the bread basket of London, Borough Market, Padella was born out of a desire from Tim and Jordan to make quality handmade fresh pasta accessible and at £7 to £10.50 a dish these are prices everyone can afford. As with Trullo, Padella uses traditional Italian techniques with quality British produce to make real, slow cooked sauces and Italian ragus. 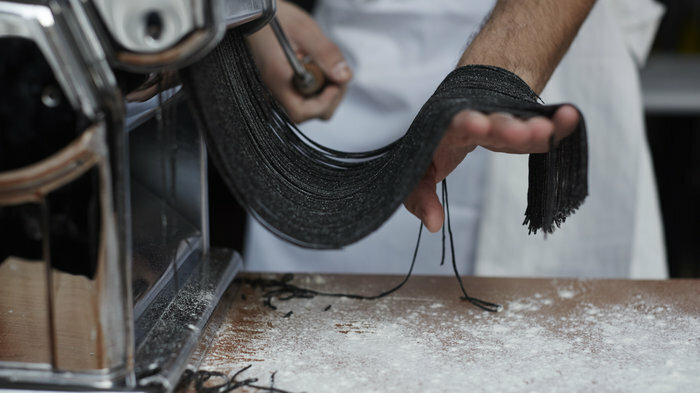 The signature dish is pappardelle with 8-hour beef shin ragu and other options include tagliarini with brown shrimps, green and yellow courgette, squid ink tagliarini with mussels, chilli and oregano, and ravioli of pumpkin & marjoram with sage butter. Sleek, traditional and functional, the two floor restaurant has counter seating the length of the ground floor and overlooking Southwark Street. An Amalfi-inspired Italian serving hearty, rustic and delicious dishes. Swapping fancy food for simple sustenance, the owners of The Manor - the same team behind The Dairy and Counter Culture - have transformed the Clapham site into Sorella, an Amalfi-inspired Italian serving hearty, rustic and delicious dishes. The recipient of a Bib Gourmand in the 2019 Michelin Guide, the restaurant has won over critics and local alike with its menu of cicchetti, antipasti, gnocchi and pasta. Dishes include truffle arancini, squash gnocchi with girolles, linguine with octopus and peppers, tagliatelle with wild mushrooms, and Hereford Denver beef and glazed beetroots. A more casual dining experience than the renowned Michelin-starred restaurant below. Offering a more casual dining experience than the renowned Michelin-starred restaurant located below, Upstairs at the Trinity was opened after a complete refurb of the ten-year-old Trinity . Swapping white tablecloths and intimate dining with communal tables, an open kitchen and pine floorboards, the restaurant serves small plates that bring together influences from Britain, France and Italy. Expect dishes such as crispy pork jowl fritters, grilled veal tongue with potato salad, BBQ lamb fillet with roast onion and ricotta, and smoked haddock croquettes. Swapping formal for casual doesn't affect quality, however, with Upstairs the recipient of a prestigious Bib Gourmand award. From cheap budget places to stay to luxury 5 star suites see our deals for hotels, including Holiday Inn Oxford Circus from 60% off.